Its been a really long time since I blogged anything on here, but here is something that I found the other day that I really wanted to share. No need to read further if you don’t want. Follow the link below, and scroll down the bottom of the page. No login, no hoops to jump through. There are a few books on their site regarding BASIC for early home computers, but the book that got my attention is the book pictured above, How to Make Computer Controlled Robots. I remember borrowing this book from the library as a kid, and I really wanted to make one of the robots that are outlined in the book. I never did make the robot of course, but now I have a digital copy of the book, I’m tempted to give it a go. It will go on my list of things to do some day. This one was almost redundant by the time I got it, as I had already made my own board with an LCD screen. 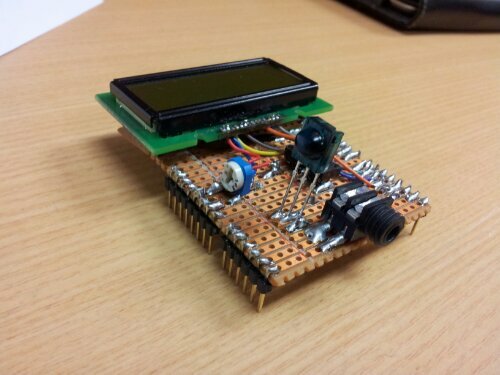 This one, however includes an array of buttons which would make creating, and navigating menus in the Arduino easy. From recollection, the buttons are interfaced via a couple of analogue pins, in order to save the digital ones for the LCD, and/or other uses. Initially, I was disappointed with the fact that Arduinos don’t seem to like talking to serial devices directly. A bit of research revealed that using one of these MAX323 chips, which you can get on a circuit board, ready to power and wire, from eBay nice and cheap. I am hoping this will make it possible to communicate with devices which are controlled by RS232. I’m somewhat interested in trying to use use the arduino as an audio visual controller. 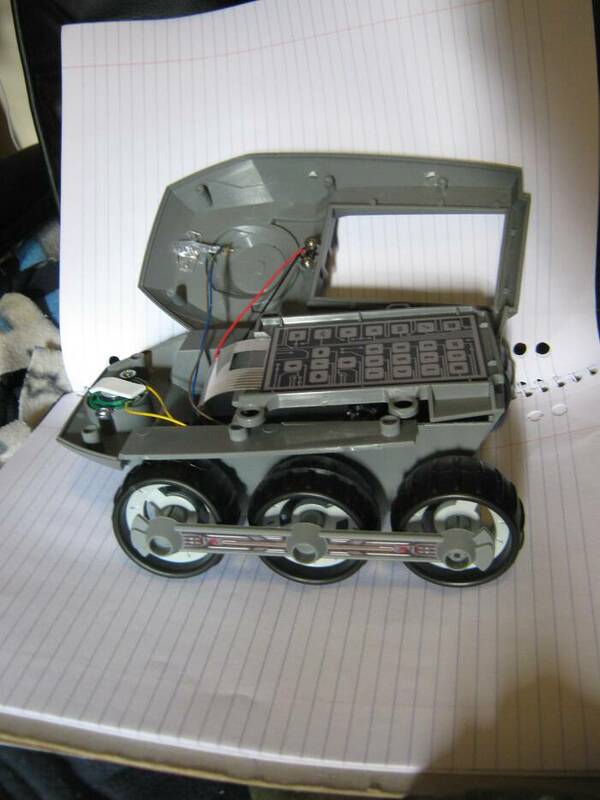 Arduinos make awesome robot brains according to the internet, and what better way to provide motive power to a robot than a motor shield from eBay as well. These appear to be knock offs of other motor controllers, but hopefully the one I bought will provide useful. I just need to work out its specs, and how to use it. Measuring motion means you can make all kinds of motion controlled devices, or measure your devices movement. That sounds like fun. Might be handy to team up with the motor control shield or something, to help control a robot of some form. 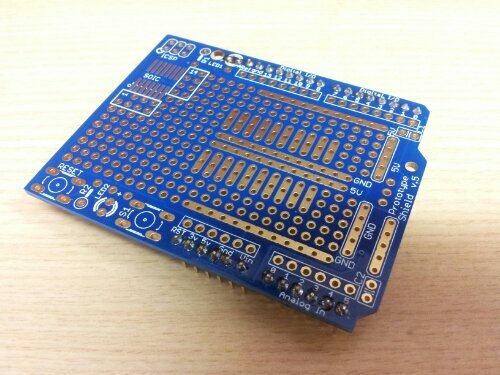 This one is I2C, so it will be a test in working out how to use I2C networks. So, hopefully they should yield some entertainment. 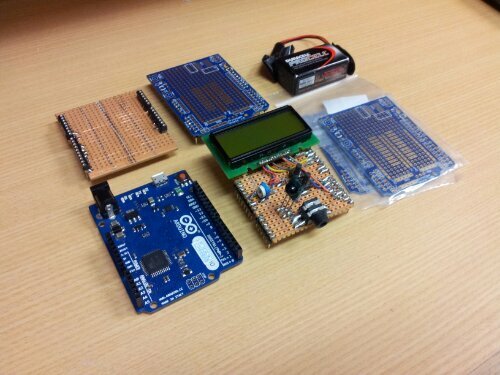 One thing I’m finding is the amount of different Arduino boards there are out there. If you think of something, there probably is already a board out there to do what you want to do. If you want to make something, almost all you need to do is piece the system together, and then program it. That is pretty cool if you ask me! Finally, I’ve bought myself an Arduino. Pin wise, the Arduino Leonardo seems to be pin compatible with other Arduinos, however it does have some extra pins (such as the i2c pins on the digital side). 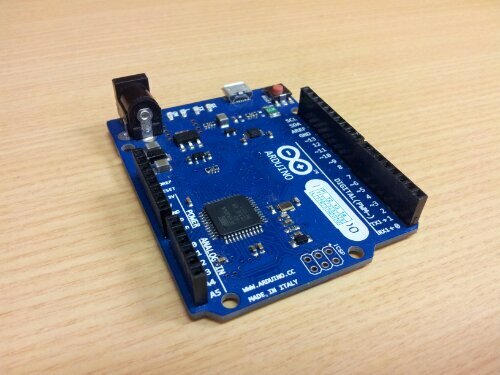 That can be kind of a pain, as it means prefab prototype shields might not have all the pins you need to use this Arduino board to its full advantage. Using Ken Sherriffs IR transmitter library allows this board to be able to send, and/or receive IR remote commands. Eventually, my order of protoshields arrived. These things are all over ebay, and usually come with headers and a little breadboard that piggy backs onto it. I didn’t really want the breadboard, just the straight PCB. I eventually found them at DealExtreme for $2.30 without anything other than the PCB. I bought 3 for starters. I wouldn’t mind getting some of the piggy back headers for them at some point, as that would allow me to use several different PCB’s at once, in a little stack. I have since had a few more bits and pieces delivered, but those will have to wait until the next installment. 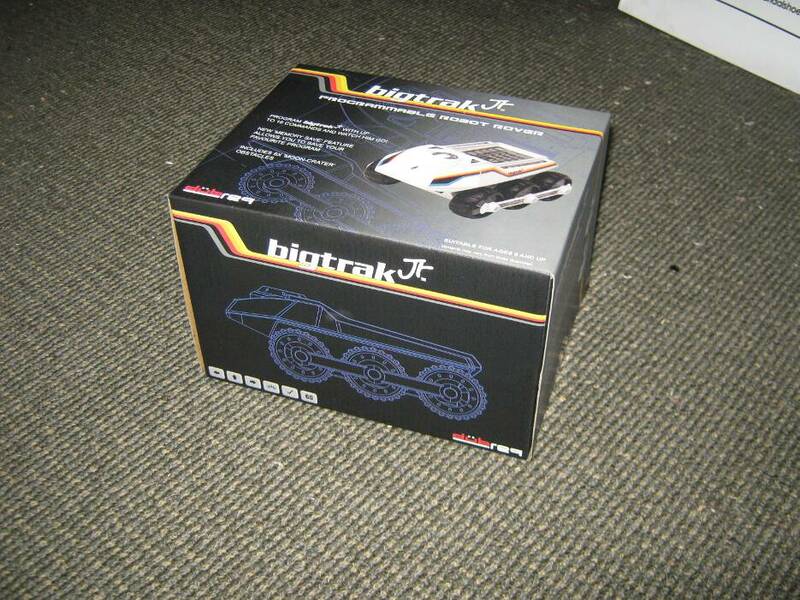 So, I just got my hands on a Big Trak Jr from Thinkgeek. The Big Trak boxed up. Let me open it already! The Big Trak was a programmable toy robot which was released in 1979. Over 30 years on, and now we see the second coming. A smaller version, which I believe has many of the original features, and at least one extra one – the accessory port. I never owned an original Big Trak, I don’t even know if they were sold here in Australia. I bet they were expensive too. A heck of a lot more than the $24.99 +pp I paid for the Jr. I wish I did though, these things are pretty awesome. At that price, they are not just great value, they are a viable hackable robotics platform. If you don’t want to keep the controls, scrap it all, add a PicAxe or a small arduino, and bazinga!, a fully programmable autonomous robot! I hadn't owned it for 24 hours before I'd unscrewed the top! I've just got to see whats inside! Here is the underside of the accessory port. The whole port comes out easily just by removing those two screws! 6 Philips head screws was all it took to get the case off, and straight away I liked what I saw. There was just 2 wires that went to the accessory port. A black one, and a red one, and they connected to a standard 3.5mm TS (mono headphone) connector. 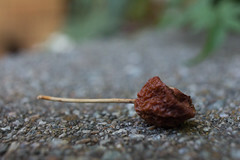 It didn’t look like there was going to be any fancy communication protocols, or proprietary connectors to deal with! They couldn’t have made this easier! A little probing with a multimeter showed that it was outputting a bit below 4v. I Didn’t measure the battery voltage to see if it’s outputting full battery power thru to the port or not, that will be something I should test later on. 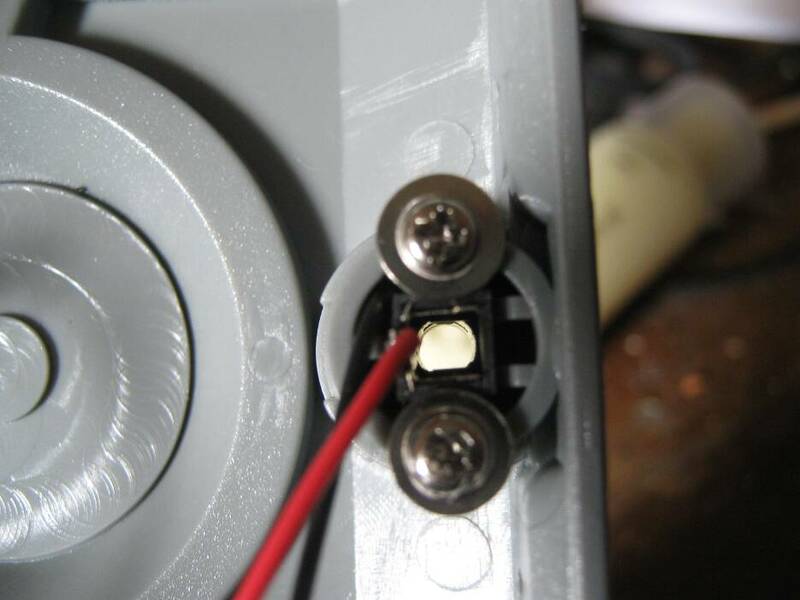 And here is the little LED on a plug which I made, and how it is wired. Then it was testing time. Plugging in the LED, and turning the Big Trak on, I programmed in a trigger output, and the LED lit up just as it was supposed to. Now I’ve gotten the LED to work, what’s next for me? some other kind of device. Maybe a motor? 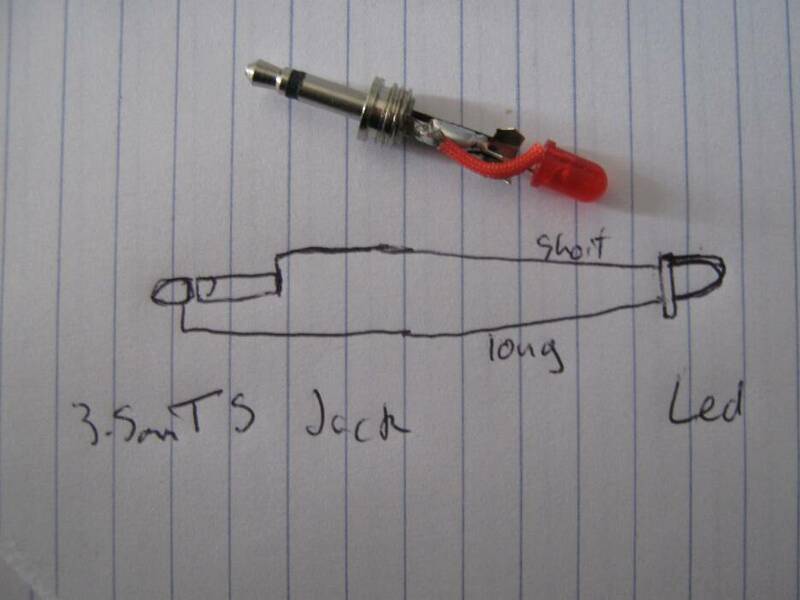 a DIY rocket launcher? extra machine guns? The choice is almost unlimited. I’ll have to see what I have kicking about. I’ve always been intrigued by hacker spaces & similar community based workshops. In this day and age its getting harder and harder for someone to have their own workshop. I had been under the impression that there wasn’t much around here in australia, I guess its a habbit I’ve fallen into, just assuming that there isn’t the population base availiable here in australia, and even closer to home, canberra, to support these kinds of places.I thought, at best there would be some “men’s sheds” about somewhere. If the small town my parents are from can support one of these, then surely so can canberra. The only problem with these are they generally seem to be run and populated by older men, who have retired. 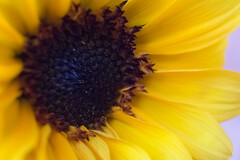 I have nothing against older people, but I’m not quite ready to become one just yet. 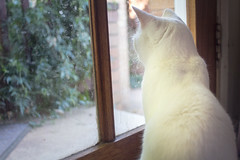 However, I just googled hackerspaces in australia, and up popped MakeHackVoid.com. A Hackerspace, right here in Canberra. They have a shop, tools, people. Sounds good. talking to other people can spawn ideas, and get you motivated to work. Access to tools you don’t have access to otherwise is also very handy, and a nice area to work is also a plus. It sounded pretty cool, until I realised to become an “associate member”, it costs $50/month, with a 6 month buy in (so $300). Sure it has a fair bit to offer, but I don’t think I can justify that much cost. I’m better off injecting that money into stuff of my own. for 6 months, I’d rather own a new welder, or some other tools, or a whole pile of steel or something…. Sure, there are casual memberships available, for $5/day, but you don’t get to use the bigger tools I’d be somewhat interested in using. maybe one day I’ll drop by one of their workshops or something to check it out, who knows, maybe the people are nice, and knowledgable, and it would be worth it. I think I’m going to keep doing things on my own for the time being. At the moment I’m more interested in working with metal instead of electronics (does anyone else have too many interests, and have to cycle thru them, or is it just me?). I think I’ve got enough tools, skills and junk to keep myself entertained for a while.